23 people on a task force in Allen County have been in charge of planning a year’s worth of events to celebrate Indiana’s bicentennial. “We tried to include as much of the community as possible … to do things that people will engage in for a longer period of time then just a day or even longer than the bicentennial year,” Curt Witcher, county coordinator, said. Allen County has held events such as All-In, a community festival, and the “Be A Tourist in Your Own Hometown” day, where 16 Fort Wayne museums and attractions offered free admission to encourage residents to explore the city. Allen County’s trail system allows access through nearly all of the county by bike, and 19 legacy parks along that trail will soon have metal benches through the Bicentennial Bench Project. This project was one of several that will last even though the torch has crossed county lines. “They’re gonna have the bicentennial state logo cut out of the medal and then Indiana 1816-2016, so at least for a generation people will know hey, in 2016 we celebrated our 200th birthday,” Witcher said. The torch started in Allen County on October 1st on the courthouse green. 26 torchbearers brought the torch through Allen County into DeKalb county. The relay route passed historic cemeteries, bridges, schools and places of worship to honor the history of Allen County and recognize the contemporary advancements currently taking place, such as the downtown renewal of Fort Wayne. For Witcher, Indiana’s bicentennial has a personal meaning because his ancestors have been in Indiana since the 1820s. Another aspect of Allen County’s bicentennial is the 200 @ 200 project, spearheaded by Todd Maxwell Pelfrey, executive director of the History Center. 200 artifacts were identified and are on display at the Center and online. The Center’s displays are showcased for three months before returning to storage or a permanent display. The themes were developed, and then items from the center’s storage and permanent displays were selected to fit those themes. January’s theme was iconic Fort Wayne, and October’s theme deals with public safety. Pelfrey said all items were from the Center’s 28,000 object collection. “Deciding on 200 pieces was quite daunting, and we had some wonderfully spirited conversations about which objects and which stories to highlight, and we feel really, really confident that what we have presented is a great overview of our community’s experience over the past 200 years,” Pelfrey said. 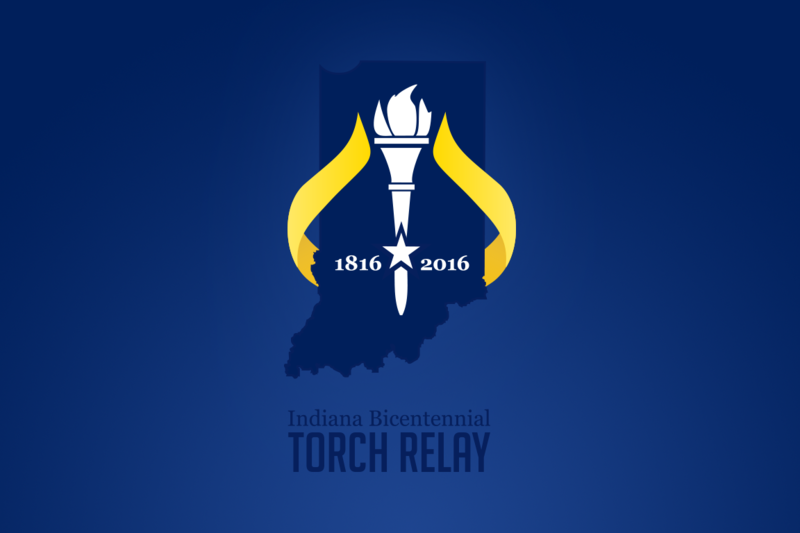 Two torchbearers carried some of Fort Wayne’s history and their family history along with the torch. Todd Sidel carried the torch posthumously for his father, Alan Sidel, who was a family physician. Sidel said that he still hears stories from people who were affected by his father in some way. Jacob Feichter is a 99 year resident of Allen County. His grandfather, a Swedish immigrant, moved to Fort Wayne in 1858, and his father built the house he grew up in. Feichter, a former realtor and home builder, said Indiana’s population has grown and educational opportunities are better. When he started in real estate, many Indiana residents didn’t have electricity.